Arena Financing Private (80% bank loans, 20% from building owners). City contributed $30 million infrastructure costs. Naming Rights United Airlines paid an estimated $1.8 million annually for 20-year naming rights in 1994. 1992-1994 - Attendance for Chicago Stadium, Chicago, Illinois. 2013-2014 - Attendance includes one game at Soldier Field. It was the dawn of the Next Ice Age. After 65 years in the historic Chicago Stadium, the Blackhawks moved across Madison Street for the 1994-95 season and into their new home - the United Center. The Blackhawks' first season in the United Center was certainly a memorable one. Chicago hosted Edmonton on January 25, 1995 in the United Center's inaugural NHL game. Blackhawk forward Joe Murphy scored the first goal in United Center history as the Oilers defeated the Blackhawks 5-1 in the historic game. The United Center, which has a capacity of 20,500 for hockey (almost 3,000 more than the Stadium) was filled to the rafters almost every time the Hawks took the ice. The Blackhawks set an NHL record by averaging 20,833 fans during the 1994-95 season-becoming the first team in NHL history to record an average of 20,000+ fans for one season. During the second season of action at the UC, the Blackhawks set another NHL attendance record, becoming the first team in league history to average 20,000+ fans for an entire 41-game regular season. Chicago averaged 20,415 fans per game as 837,021 fans came to watch their Blackhawks. The Blackhawks continued to set attendance records during their third season at the United Center as a team record 22,819 packed the UC for a matinee against Wayne Gretzky and the New York Rangers on February 15, 1997. The first six seasons of Blackhawk hockey at the UC have provided many exciting moments on the ice, but those have been almost equalled by the experience of visiting the United Center. The United Center features the ultimate in fan entertainment and comfort. Some of the new amenities include: an eight sided video replay scoreboard, theatre-style seats, 210 luxurious suites, over 3,000 Club seats, 46 permanent concession stands and 194 points of sale, a cocktail lounge, private banquet facilities, interactive concourse displays, TV monitors throughout the building, Fandemonium (a Blackhawks and Bulls souvenir store) and four other merchandise stands. The United Center also contains the best in fan convenience and accessibility. There are eight escalators and extra wide concourses for better mobility. Cash stations, along with coat and parcel check areas, are available on every level. There are 48 restrooms and an increased capacity for women's restrooms. Seating is unobstructed throughout the arena. The United Center is a 960,000 square foot multi-use facility that was officially opened on August 18, 1994 after a ribbon cutting ceremony. The UC accommodates 20,500 for hockey, 21,500 for basketball, and up to 23,500 for concerts and other entertainment. The United Center was also home to the 1996 Democratic National Convention. 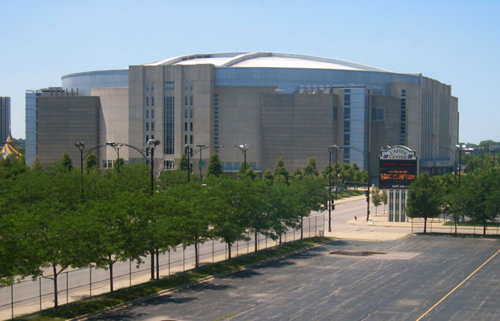 The United Center is located between Madison and Monroe Streets on the city's near west side. And while no building can recreate the atmosphere of the historic Chicago Stadium or the events that took place there, the six seasons in the United Center have already provided many special moments that are sure to grow in the hearts of Blackhawk fans. The United Center Stadium of the Chicago Blackhawks is brand new, opening in 1994 across the street from the historic Chicago Stadium. It cost $175 million to construct, and is at least twice as large as the old place. The building's exterior is modeled after 1920s architecture, which makes it look older than it really is. Sightlines inside are superb, and the seats are very comfortable. From O'Hare Airport, take 90 East to Madison St. exit. Turn right on Madison, and go for about a mile, where the Center will be on the right. 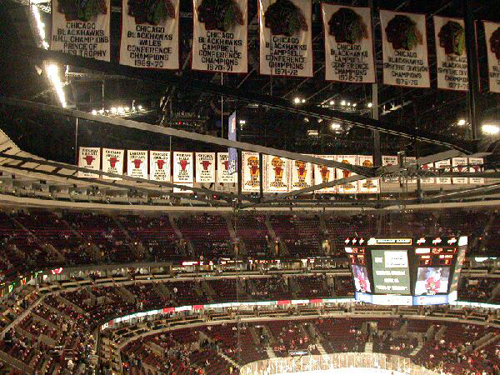 No one will try to dispute that the United Center isn�t as cozy as the Chicago Stadium. Architecturally, legally (thanks to city building codes) and mathematically, that wasn�t possible. The Hawks new home covers roughly 900,000 square feet. The old barn measured only about 300,000. But what was lost in character when the Stadium closed, has been replaced by hundreds of technical improvements in the United Center. The new 20,500 seat arena is the most modern, well-appointed facility currently housing a National Hockey League team. "Right now, I think this is the best (new arena) that�s been built," said Terry Savarise, the facility�s senior vice president of operations. "The owners didn�t spare any money in fan comfort and convenience." Fans will notice the difference instantly when they walk through the doors. While the Stadium�s cramped, dark hallways had their charm, you had to push and shove your way through them before and after games and during intermissions. The United Center has wide, airy concourses that permit fans to mingle and chat while not obstructing others who might want to rush to their seats or one of the 48 public restrooms. For those who really want to move up in a hurry, eight escalators and seven passenger elevators server every level of the facility. In general, the building has been designed to accommodate the needs of people who are on the go. Automatic teller machines are located on the main and club levels. A guest services office will help fans in general seating areas with special requests. You can even receive an emergency phone call if you register at the Ameritech Emergency Message Center. Fans seated in the club level - the arena�s middle tier - or in one of 216 sold-out private suites - get even more personalized attention. Suite holders and visitors even have concierges at their disposal. But to truly get to know and appreciated the United Center, walk, don�t run. There�s plenty to grab your attention. For instance, the old wooden novelty stands at the Stadium have been replaced by four sportswear stores plus Fandemonium, the building�s full service, 5,000 square foot store for Hawks, Bulls, NHL and NBA licensed merchandise. Even just a few years ago, the amount of NHL apparel and novelty items was limited. However, thanks to aggressive expansion by NHL Enterprises, the league�s marketing arm, thousands of products with NHL colors and logos are available today. Besides being a retail outlet, Fandemonium also includes a Hawks and Bulls Hall of Fame and a 70-seat theater. The Hall of Fame includes real Blackhawk lockers from the Stadium, old equipment and memorabilia right down to Jim Pappin�s first contract. The theater will run various sports theme films throughout the year. Fans also will find the selection of food and beverage more varied, appetizing and accessible at the United Center. The building has 46 concession stands serving sports staples such as hot dogs, hamburgers, popcorn and pizza. However, the menu has been expanded to included grilled chicken, meatball, Italian beef and other deli sandwiches, Mexican specialties and even Chris Chelios� "Cheli�s Chili". "Sweet Treats" sells dessert items ranging from Edy�s soft-serve ice cream to Fannie May candies. Thanks to modern preparation facilities and additional personnel, food and beverages should be fresher and better tasting than in the Stadium. Feeding up to 20,000 people on demand is a major undertaking. So at the United Center, more than 600 food service employees are on hand for every Hawks game. At the Stadium, food and beverage staff was only 200. Just how much food and refreshments are sold? According to Larry Acton, vice president of Bismarck Enterprises (the United Center�s caterers) during the first half of the 1994-95 NBA season, Bulls fans consumed an average of about 3,500 slices of pizza, 600 pounds of hot dogs, 1,500 gallons of soda and 4,000 gallons of beer per night. Hawks President Bill Wirtz, knowing his customers preferences, gave an early order that beer must be both fresh and cold at all times. As a result, the United Center has a state-of-the-art brew delivery and vending systems. Fifteen brands of beer are available in the facility and all of them are pumped from eight distribution stations to individual vending lines throughout the building. Acton says Bismarck accepts no batches that are more than 15 days old and points out that the new system eliminates the aluminum kegs that once rolled down the Stadium�s corridors. Beer remains available from vendors in the seating area. But no longer do the vendors sell pre-poured brew from cups in trays. Instead, vendors walk the stands with backpacks loaded with the most popular brands. The biggest benefit: inside the packs, beer loses only one degree of chill per hour. Vendors then dispense beer via a hose directly from the packs into cups when the customer orders. "It will take a few more seconds to serve, but the quality of the product is greatly improved," Acton said. For fans who access club seating or private suites, the level of service - and menu - is even better. On the United Center�s club seating 200 level, fans may place orders from and be served in their seats, or visit concession stands themselves. The Club Level also includes spacious lounge areas, which are suspended above the main, ground level concourse. Club seat ticket holders also may visit the Chicago Stadium Club, a restaurant which features a full-service mahogany-paneled bar, on the west end of the building. The Stadium Club serves pre-game meals from an elaborate buffet or a la carte. Entrees, priced similarly to those at other white-tablecloth restaurants, range from prime rib, to veal chops to grilled salmon. The Stadium Club is also open after games for lighter fare and drinks. The club, or portions of it, also can be rented for special private receptions and affairs. Private suite guests get the ultimate in service. The boxes, which are leased primarily by corporations, have annual base prices ranging from $55,000 to $175,000. Boxes on the lowest tier are the most spacious and have the most amenities, including private washrooms. All suite guests, however, can select from trays of cold and hot appetizers and entrees. To keep the food and beverages fresh, the suites include refrigerators and steam tables. A dessert cart also makes its rounds on all three suite levels during events. All suites have "front porch" viewing areas that extend into the seating bowl and main parlors furnished with sofas, televisions and wet bars. Before the United Center opened, suite holders were able to choose form several interior design packages. Once the game begins, all fans can enjoy the United Center�s scoreboard, which includes four 12� x 9� Sony JumboTron screens for replays and other video presentations. The eight-sided scoreboard also has four matrix screens that relay statistics and other information. In addition to the game score, goal scorers, penalties and other customary hockey information, the new JumboTron scoreboard provides a wealth of other game statistics. The new data includes attack zone time, possessions off faceoffs, prime scoring chances, turnovers, hits, blocked shots and other information that NHL coaches closely watch and review with their teams. Besides a visual show, fans will continue to be entertained musically in the United Center. Hockey fans will be glad to hear the familiar sound of the Barton organ from Chicago Stadium -- it was re-created for the new place, something that took over a year to do. The old Barton pipe organ that was housed in the Stadium could not be moved across the street, however, the United Center�s Allen Digital Organ has been designed to recreate the distinct sounds of its predecessor, plus many more. In fact, the actual tones of the Stadium�s Barton organ and other pipe organs were duplicated electronically into the new instrument, which is located in the southwest corner of the 300 level and is connected to the main press box. The United Center also includes improvements that fans may never see or hear, but that benefit the people who work there. At last, the Bulls offices are located in the same building that houses their home court. Meanwhile, the Hawks offices, which were cramped and windowless at the Stadium, are bright, spacious and located on the east side of the United Center. Meanwhile, other arena management and support employees have improved working areas, including new offices, meeting spaces and locker rooms. In the Stadium, press work areas were installed as an afterthought. At the United Center, the main media facilities were planned in advance. Live television and radio broadcast booths are in the middle of the south side. Meanwhile, print and non-live electronic journalists are accommodated on multi-tiered booths on either side. Finally, the Hawks players, coaching and training staffs have a dressing room, training and office facilities that are as well-appointed as any in the NHL. The entire team complex is located on ice level on the north side of the arena with direct access to the Hawks� bench. So how�s the area designed? At the heart is the club�s main dressing room with individual player spaces (there are no divided stalls or lockers) arranged in a large "U" shape. The wooden bench at each space opens for storage, with shelving above. In this large room, players actually put on their skates and gear for games. The main dressing area also houses a projection and wide screen TV for reviewing game films and a large dry-erase board where the coaching staff can diagram plays. Adjacent to the main room is a players� lounge area where the Hawks can review videos or simply watch TV after practices. This also is where players change in and out of their street clothes. Off to another side of the main dressing room are the team�s medial and off-ice training rooms. The medial area, which includes three treatment tables and a massage table, is better equipped than many doctors� clinics. The off-ice training room includes rows of stationary bikes (which the Hawks ride religiously) and other cardiovascular training gear, plus machine and free weights. Naturally, any sports dressing room includes showers and other standard plumbing fixtures. The Hawks area also has the not-so-standard whirlpool, hot tub and a wood-paneled sauna complete with traditional hot rocks and water buckets. The coaching staff has their own area which is also part of the team�s complex. The Head Coach has a private office and Assistant Coaches share a space. Between the two offices is a conference room. Even the training and equipment staff has it own office and work area, something that really didn�t exist at the Stadium. In addition to expanded storage areas for sticks and equipment, the staff also has a separate skate work room with a state-of-the-art skate sharpening machine. Compared to the Stadium, the United Center is almost a small city. And thanks to its facilities, the arena�s nightly "population" of fans, employees and athletes should stay comfortable and happy. Source: 1994-95 Chicago Blackhawks Yearbook. Construction was begun in April of 1992, and the ribbon cutting ceremony was held on August 18th, 1994. 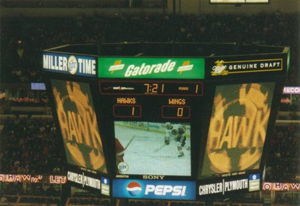 The Blackhawks inaugurated hockey in the United Center on January 25, 1995, defeating the Edmonton Oilers 5-1. Blackhawk forward Joe Murphy scored the first goal in the United Center. * 3,500 tons of steel were used in the construction of the building-enough to build 28 life-sized replicas of the Statue of Liberty. * 645,000 sq. ft. of drywall laid which is enough to cover 13 floors of the Sears Tower. * 41,000 cubic yards of concrete were used in the building-enough to equal a 5-ft. wide sidewalk from the United Center to the Berto Center in Deerfield, Illinois (Bulls' practice facility). * The building has 1,850 doors, 6,500 parking spaces, 8 escalators, 9 elevators, and 50 bathrooms that are equally distributed among men and women. * The United Center is 136 feet tall. Many guests believe that new ice is created with each game. This is far from the truth. The ice is originally created at the beginning of the season in September for the Blackhawks Training Camp. The very first layer of ice is painted white to give it the appearance that it is clean and flawless. The Chicago Blackhawk Indian head, sponsor logos and the regulation lines are hand-painted with a quick-drying paint called Jet-Ice. The logos are then sealed and the ice is sprayed on one layer at a time until it becomes 1" thick. To create and paint the ice takes approximately 30 hours. That ice remains down until late November when Ringling Brothers and Barnum & Bailey visits. The circus has a 2 1/2 week stay at the United Center and for that run the ice is melted. There are two reasons for this. The first being that the high wires and rigging equipment used by the circus acts must be anchored into the concrete located below the ice. The second reason is that the longer the ice is covered, the worse the skating conditions become. After the circus and before the next event, new ice is created. That ice remains down until the end of the Blackhawks season. The regulation hockey surface is 85' wide and 200' long, which is 17,000 square feet of ice. * On average there are 7 to 10 tons of garbage collected at the end of all Chicago Blackhawks games. * The United Center has three Zamboni ice resurfacing machines -- one was purchased in 1969 and is the oldest model in the entire league. * The United Center was one of the first arenas in the country with the ability to have a semi drive right through the loading dock and out onto the floor for load in/load out. * Denis Savard was the first Blackhawk to have his uniform number retired at the United Center when his No. 18 was raised to the rafters on March 19, 1998. Strangely enough, in the early morning hours of that same day, a certain United Center employee received direct permission from MJ to dress the Jordan Statue in full Savy gear-skates and a Denis Savard jersey. Although the joke caused some sense of controversy around the building, it was still a great sight to see even if only for a few hours. * On February 22, 1996, Blackhawk winger Tony Amonte recorded the first hat trick in the United Center against the St. Louis Blues in the 53rd game played at the UC. 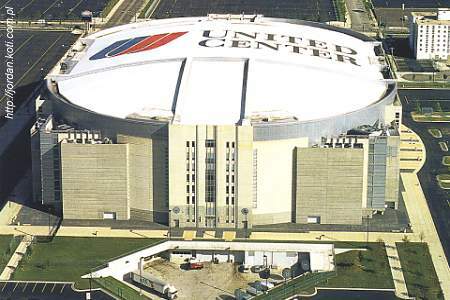 February 21, 2001 - The United Center was opened in 1994 to replace the aging Chicago Stadium. Sitting at the opposite side of Madison Avenue from where the old Stadium existed, this facility dominates the surrounding neighborhood in its sheer size and fact that there is little more than empty lots for parking in the immediate area surrounding it. This building was constructed during the midst of the Bulls heyday of the 90's when the team was the hottest ticket in town and by the looks of the size of this place they built a venue large enough to accommodate as much of the demand as possible. In the lower concourse you will find Fandemonium, the main souvenir outlet for Bulls and Blackhawks merchandise. Also there is a private restaurant for season ticketholders (The Locker Room) and a public one (The Windy City Grill)... this amidst a wide selection of concessions of almost every type of food one could ever want!!! The Club concourse features the Chicago Stadium Club, a Harbour club style buffet restaurant where the walls are adorned with all kinds of prints and memorabilia from events that occured at the Bulls and 'Hawks old stomping grounds. The rest of the club concourse has plenty of upscale food and merchandise concessions as well as lounges with plenty of room to pull up a nice comfortable chair, put your drink on a table and watch the game on one of several monitors. And even in the upper concourse you will find the wide selection of food and drink available in the building's pricier areas. Not only is there seating for 21,500 fans in three main levels, there are suites above each of those three levels (total of 212). Despite three years of Bulls players that masquerade as an NBA team and a few years of mediocrity on the ice this building still sells its Bulls games out on a regular basis and draws a healthy crowd for the Blackhawks. We must admit though that the sold out building we sat in for the Bulls game only appeared to be about three quarters full. There must be plenty of Bulls season ticket holders who won't part with their tickets for fear that the glory days will return!!! (Fat chance!) Also newly added to the bowl is an LED Daktronics display board which circles the bowl between lower and club levels and between the club and upper levels. Outside of the Xcel Energy Center in Minnesota this arena has the most extensive use of this technology of any venue we have seen. As famous Chicagoans Siskel and Ebert would say "two thumbs up" from us!!! The Bulls and Blackhawks are two of the most respected and historic franchises in all of sports and the cloth that hangs here reflects that. No silly 6th man banners here as the Bulls and 'Hawks proudly display their great achievements (NBA Titles,Stanley Cups etc. etc.) and honor their greatest players such as Stan Mikita and Michael Jordan (WHO?). The Bulls and Blackhawks are famous for events that occur before the game begins. The Bulls were amongst the first to begin the widely used concept of turning out the lights and blasting the music at full bore while introducing the Bulls team to the court. To use another catch phrase here, always imitated, never duplicated. And if there is one place to catch the playing of the Star-Spangled Banner, make sure it is at the United Center before the start of a Blackhawks game. Here the fans cheer loud and wildly throughout the singing of our national anthem and it is truly a unique moment to experience. One jumbotron skit was something called a "Kiss Cam" in which the screen showed a couple together in the audience and the idea is to get them to kiss on-screen. Most couples usually do oblige, however some do need a bit of goading from the fans. The two guys wearing Redwings jerseys did not oblige. "Sing for your Supper"- this is a contest that pits two people in different rows against each other in a karaoke contest. The winner gets dinner for his/her entire row free. BUT GET THIS, the rest of the fans in the audience that are judging have three options to choose from. They can choose either one as the winner or they can also choose neither if the two contestants do not live up to standards and everyone goes home hungry. This was the result the night we were there!! The day of the Blackhawks game we happened upon a terrific establishment called Cheli's Chili Bar, on West Madison, about a mile from the United Center. This "Cheers" style pub is owned by none other than Chris Chelios himself and is run by Chris' parents and sister. We spent the entire afternoon there and the Chelios family treated us like kings. What warm and terrific people! This is a wonderful building with amenities so plentiful that you would have a difficult time finding a venue with more things to see, do, and eat than this one. As far as game presentation is concerned, the Bulls do more of the things now typical of today's fan experience (tossing t/shirts into crowd, 3 live bands in the concourses, face painting etc.) while a Blackhawks game reminds you more of when a game was simply that, a game. Peter for one found this rather refreshing as Andrew tended more to enjoy the in game entertainment and accepted it at part of the total experience. An outstanding venue, albeit quite a bit oversized in our opinion. Levy Restaurants is taking over concessionaire responsibilities at Chicago's United Center. The contract was held by Bismarck Enterprises Inc., which was founded by Peter Wirtz, the younger brother of Rocky Wirtz who owns the Blackhawks. Peter Wirtz plans to continue the company, but it will be focused on consulting rather than operations.